As the Tate Modern prepares to open the UK's first retrospective on Georgia O'Keeffe, we sat down with Hannah to discuss the artist's remarkable life. We have a feeling 2016 will be known as the year that the Tate Modern surged ahead to become the leading contemporary art gallery in the world. Surely the most fascinating. Their brand new Switch House opened on June 17th, adding 10 storeys to the already-colossal institution, under a banner reading, "Art Changes. We Change". The new building has already welcomed record numbers of visitors within in its first few weeks. Now, Tate is set to open the first UK retrospective of Georgia O'Keeffe's work in a generation. In fact, there are no O'Keeffe works on public display in the United Kingdom, so interest in the artist is reaching a fever pitch ahead of the opening on 6th July. We sat down with Assistant Curator Hannah Johnston to hear about researching O'Keeffe's remarkable life, her misrepresentation in popular culture, and what it's like to work within the (cavernous) walls of the Tate Modern. 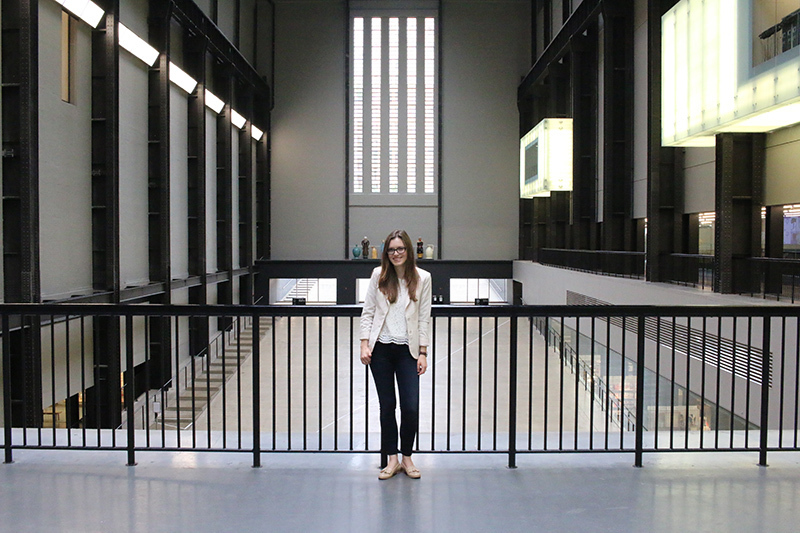 Hannah, can you tell us a little bit about your career leading up to becoming Assistant Curator at Tate Modern? I studied Art History and French in Durham – spending time living in Paris and studying at Christie’s in my third year – and then moved back to London to do a masters in Art History at University College London. 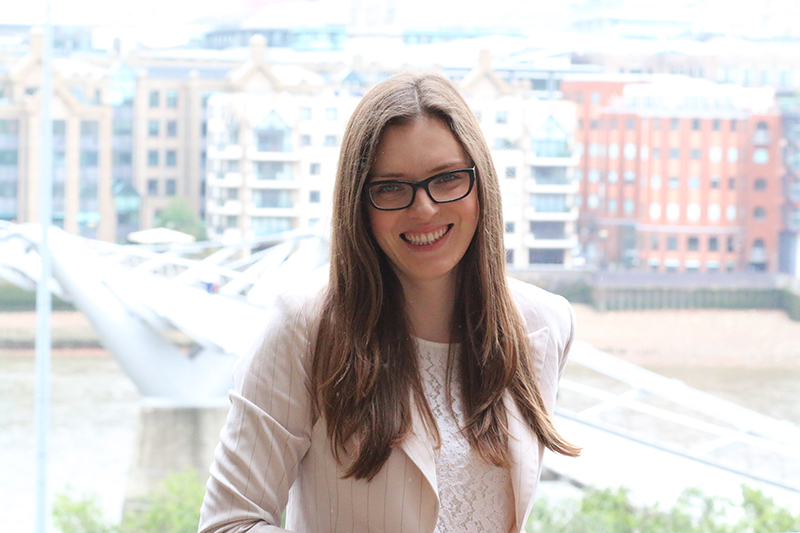 I worked at Pippy Houldsworth – a gallery in the West End – for a couple of years after graduating, before deciding to leave my position and take whatever internships I could with the aim of moving into the public sector. After time spent at the Hayward Gallery and at Tate Modern, an Assistant Curator position came up which I jumped at. I’ve now been in my role for just over four years. My family – and my late aunt in particular – had a real passion for art and art history. So it’s always been there. I’ve been visiting exhibitions since I was a little girl. Did you always want to work in the art world? Yes. I signed up to my masters degree so that I’d be able to work towards a career as a museum curator and have been pretty determined ever since. In your four years as Assistant Curator at Tate, has there been one favourite exhibition you’ve worked on that has stuck out in your memory? More than any one exhibition, I think one of the most exciting things about working at Tate is the incredible richness and diversity, and the opportunity to work on so many different projects at the same time – acquisitions research, major exhibitions, smaller shows and collection displays. Each involves a different set of skills and appeals to the museum’s different audiences. In my time at Tate I’ve curated an exhibition for the Project Space and worked as Assistant Curator on the major retrospective of British Pop artist, Richard Hamilton, alongside my work on the collection. Managing the reconstruction of Hamilton’s 1951 installation Growth and Form from archival photographs – and sourcing bubble machines, animal skulls and rare fossils – was an extraordinary task, but if I had to choose one project as a whole, I’d probably say that O’Keeffe has been most of a revelation. Georgia O’Keeffe Black Mesa Landscape, New Mexico / Out Back of Marie's II 1930 Oil on canvas mounted on board Georgia O'Keeffe Museum. Gift of The Burnett Foundation © 2016 Georgia O'Keeffe Museum/ DACS, London. What did the research process entail? O’Keeffe was very forward-thinking about the way she placed her works in public collections, so we were quickly able to decide which works we wanted to include in the exhibition. The major challenge has been convincing some of the most renowned institutions in the US to part with some of the most precious objects in their collection – if only temporarily. 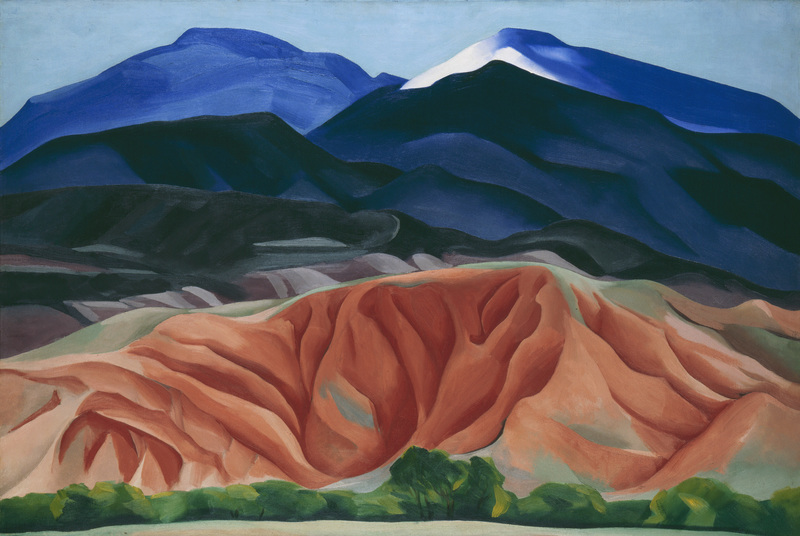 We’ve been working on the exhibition for a little over eighteen months and are thrilled to have been able to work so closely with the Georgia O’Keeffe Museum in Santa Fe who hold the estate of the artist and have the largest single collection of her work. Their expertise and collaborative spirit has been invaluable at every stage of our research. Was there anything surprising that you learnt about her work and career that you didn’t know before? For many people, one of three things tends to come to mind when hearing the name Georgia O’Keeffe: that she was a painter of flowers, that she was married to a famous photographer (Alfred Stieglitz), and that her early abstractions were veiled representations of female genitalia. You only need to watch for the episode of Breaking Bad where they talk about her work to get a sense of how she’s viewed in popular culture. The reality is that she was an incredibly multi-faceted artist and that these clichés, which have their roots in her earliest critics, are outdated and misrepresentative. Over the course of our research and amongst other things, I’ve learnt that she was a prolific letter writer, a prolific adventurer and that she was most at home in the landscape; that she determinedly opposed sexualised readings of her work throughout her life; that she was profoundly influenced by modernist photography; that her deep and lifelong relationship with New Mexico extended to its buildings and local communities, as well as its distinctive landscapes; that her relationship with Stieglitz was one of equality and profound mutual importance; and that whilst his role as gallerist and advocate in her rise to success is beyond doubt, it never would have been achieved without her unique character and single-minded ambition. Across the course of a ninety-eight year lifespan, O’Keeffe lived through almost a century of change. I hope that visitors who arrive at the exhibition with a particular understanding of O’Keeffe’s work leave with a lasting sense of surprise – that her work is far richer and more complex that she is perhaps often given credit for. 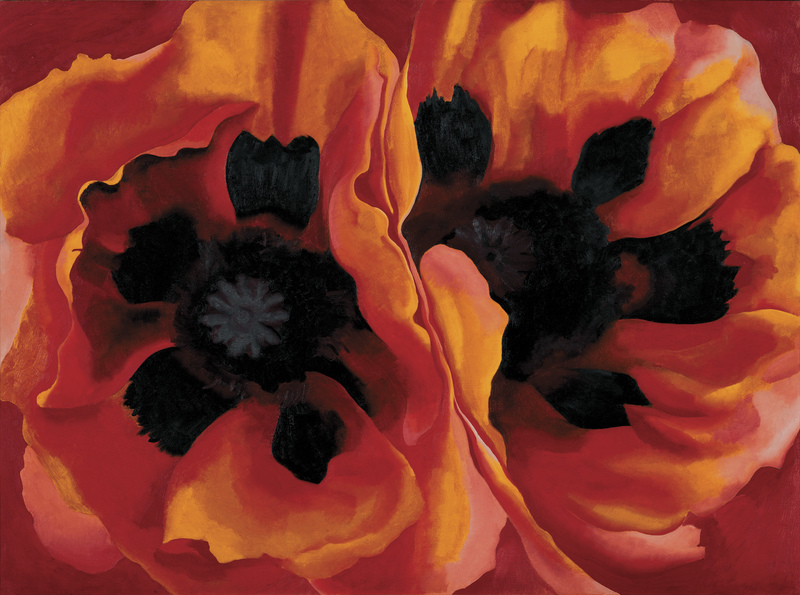 Georgia O’Keeffe 1887-1986, Oriental Poppies 1927. Oil paint on canvas. Frederick R. Weisman Art Museum at the University of Minnesota, Minneapolis © 2016 Georgia O'Keeffe Museum/ DACS, London. What was the most interesting place you travelled to? As part of the exhibition research we travelled to New Mexico, to visit the Georgia O’Keeffe Museum in Santa Fe, O’Keeffe’s houses at Abiquiú and Ghost Ranch, and some of the sites that she painted time and again, including the Plaza Blanca or ‘White Place’, and the ‘Black Place’ – an area of Bisti Badlands that O’Keeffe described as ‘like a mile of elephants’. As soon as you arrive you understand why she was drawn to the region, with its incredibly distinctive topography, dramatic colours and particular kind of light. And just driving through the landscape and the rugged roads in a modern day hire care makes you realise the extent of O’Keeffe’s early adventures more than eighty years ago. Her work spanned so many decades and she was very prolific. Is there a certain period of her work that you find most interesting? Each period in her career is an innovation in itself but I think that by the time she reached New Mexico for the first time in 1929, she’d really found her voice. We know that Tate Modern always has a fascinating spin on things and looks at things from a brand new angle. 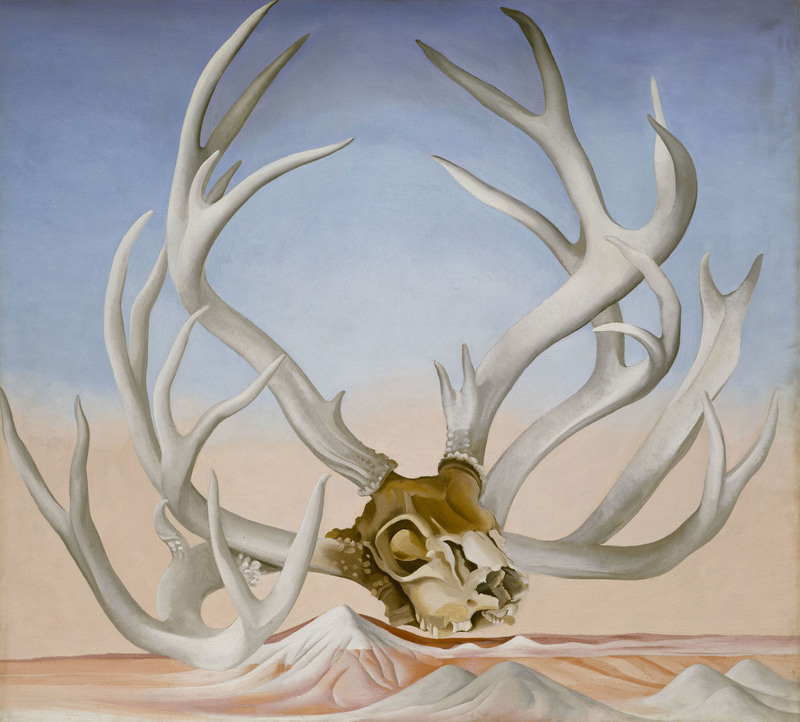 What will be different about Tate’s retrospective of O’Keeffe’s work? How is it organised? The last O’Keeffe exhibition in the UK was at the Hayward Gallery in 1993, and there are no works in public collections in this country. Unless you travel to the United States – and very widely across the US – it’s very difficult to see such a range of works, so this exhibition is really a once-in-a-generation opportunity. O’Keeffe was a foundational figure of American modernism and had a huge impact on artists of her own and subsequent generations, but has been, in some senses, eclipsed by her own fame. Our exhibition really aims to dispel some of the clichés that persist about her and her work, and tries to return to the artist’s own voice. Her flower paintings, for example, really only represent about 5% of her total output. Do you have a personal favourite piece in the exhibition? It’s hard to say as each work is unique in its own way, but I think the depictions of ‘kachinas’ – carved and painted figures of spirit beings that have long played an important role in the ceremonies and rituals of Native American communities – are amongst the most unknown and intriguing works in the exhibition. We’ve also managed to gather together a spectacular group of early abstractions which will make for a truly beautiful room. It must be such an incredibly exciting time to be at Tate with the new Tate Modern opening this year. Is there one aspect of the opening or new building that you’re particularly excited about? 2016 is definitely an exciting year for us! With the Switch House now open, and attracting record numbers of visitors on its opening weekend, it’s just brilliant to be able to share more of our collection with the public. And for people to see what we’ve been doing over the last decade or so to diversify our collection – there are as many displays by female artists as there are by male artists in the Switch House, and some incredibly striking new acquisitions on display which testify to our ongoing research. I’m especially excited to see The Tanks back open, which give performance and film a permanently visible home within the museum. What are some of your favourite galleries or museums in London or abroad? In London, the Whitechapel, the V&A and Raven Row. For aimless wandering on a Sunday afternoon, you can’t beat the Musée du Louvre. In another life, I’d have loved to have been a florist. Undoubtedly hard work, but what a beautiful way to make a living! What do you love about the South Bank/ Bankside area? What are some of your favourite restaurants in London? I like the Grain Store at King’s Cross, Ottolenghi and snacking my way through Borough Market’s stalls. Mondrian London has partnered with the Tate Modern to offer an overnight stay, full buffet breakfast, two tickets to the exhibition and two 'Jimson Blossom' O'Keeffe inspired cocktails in Dandelyan. To book, click here.